A 6.30am alarm went off on this cold and foggy morning. 5 of the PEAKY CLIMBERS agreed to rendezvous at The Green Dragon, Simon’s boozer, at 8am to commence a short but very challenging team training ride. Allen, Ben, Simon, JB and Macca. It was damn cold as we set off at 8.20am to take on this challenging ride around the Cotswolds. We were slightly late setting off as Ben a) got dressed and b) had to ‘cream’ himself up!! Short, punchy and steep climbs were the order of the day, with a tremendous amount of undulating roads – joys! The first 3.5 miles in peaked at 11.6%, the second at 6.5 miles in peaked at 23%! Macca encountered the odd asthma issue and inhalers were being used! 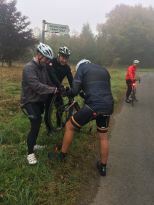 It was cold, damp foggy – not ideal weather for asthmatics (Allen & Macca) on bikes! The first puncture if the PEAKY’s session soon occurred, Ben the guilty party unfortunately. After his mechanics piled in and sorted we were back on our way after 20 mins. The weather was on the change slowly, fog lifting and the countryside breathtaking! The next heft climb came after 20 miles, peaking at 17.9%, with the next 11 miles of undulating roads and a super rapid drop to the foot of the very imposing BIRDLIP climb! What we love is as we’re starting the ascent a young whipper snapper of a 20 year old goes flying past, stick thin, saying “ah I’ve been looking for this hill, it’s supposed to be a nightmare!” This as you’d expect, met with a few PEAKY expletives! It’s 2 miles long, peaks at something north of 26% gradient – it’s a beats bluntly. Allen was superb and was first up…followed by an on form JB. Congrats to Simon, 2 weeks ago he tried and failed…this week he was up without stopping! Ben & Macca also made it to the top, via encouragement from Allen and some major screaming and shouting!!! A great team effort and one that means that these hills can be conquered mentally as well as physically! From there it was, fortunately, virtually all down hill back to the pub and wasn’t it all worth it. Simon and the team from The Green Dragon prepared a mighty fine brunch as a perfect reward for completing the ride. An awesome spread that put smiles on all and helped replace much lost energy! 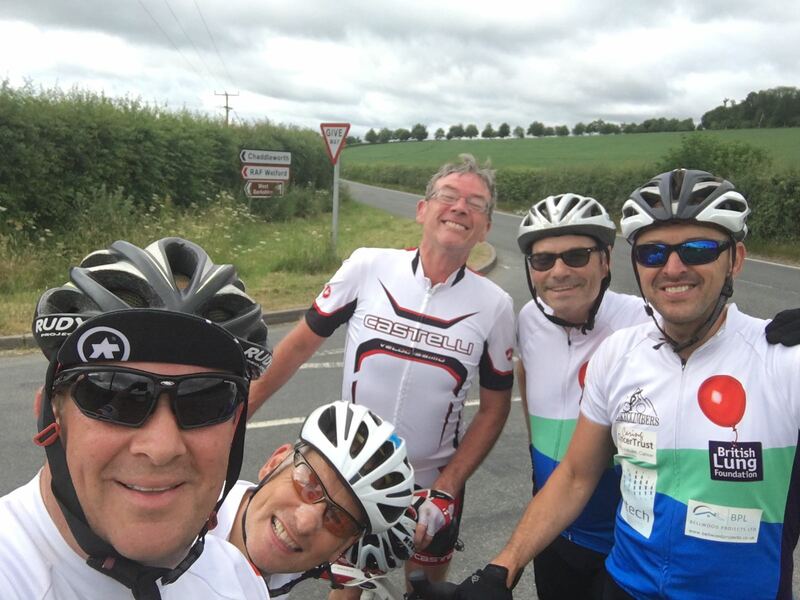 A superb team training ride, which showed great team spirit and team togetherness with everyone helping each other through all the challenging bits!